As I write this I am listening to Walt Disney World Parks music and wishing I was back there in the place where elephants fly and journeying under the sea is as easy as stepping into a clamshell. In a place called New Fantasyland, the magic is everywhere you look. Have you ever thought something was perfect just the way it was and then someone comes along and changes it and you think "Wow. I had no idea it could get any better. This is AWESOME!" I'm laughing as I type this because I thought this a lot last week when I covered the Grand Opening of the New Fantasyland in the Magic Kingdom at Walt Disney World. 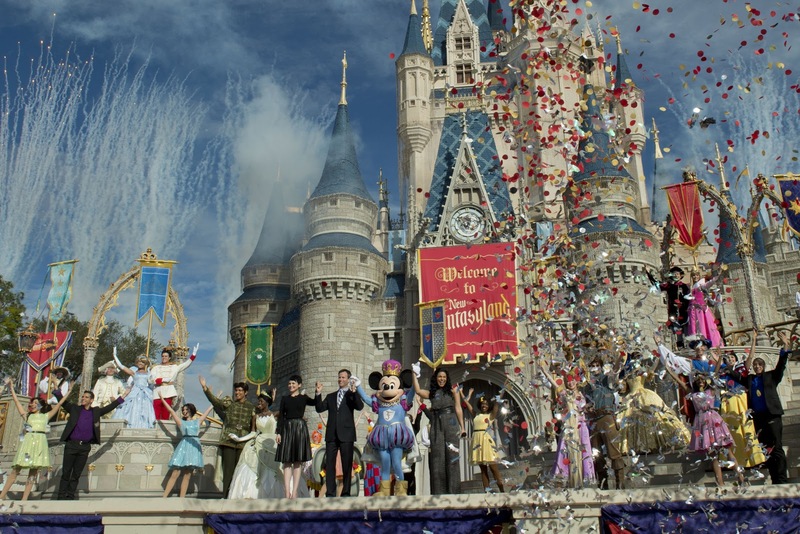 When I first received an invitation to cover the Grand Opening of the New Fantasyland I was so excited. 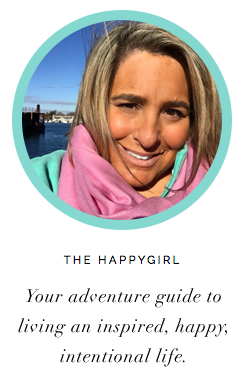 The Happygirl + the happiest place on earth! I just had no idea exactly how incredible this experience would be. There was so much to see, so much to cover, so many things to try. Thanks to my trusty media guide, Andres, we experienced adventures so vast and wonderful that it's impossible to share it all in just one feature. Here is Part I. Imagine. The place you loved as a kid, the place your parents took you, just got better, like blow-your-minds-hold-onto-your-hat better. From an enchanted grotto to the grey stuff (it's delicious! ), oh, those Disney Imagineers. They did it again. Think of the New Fantasyland as being divided into two areas: Enchanted Forest (EF) and Storybook Circus (SC). Turn the corner into Fantasyland and you'll have a hard time remembering what was here before. As you walk through this village, take the time to notice the big and small touches. Look up and there is Beast's Castle high above you on the hill. Look down and you're walking on a stone French street that looks as though it has been worn down by horse's hooves and thousands of villagers. The design of the Enchanted Forest is extraordinary. You'd swear you had stepped into a storybook fairytale. As you wind your way towards Storybook Circus, you may find that the music and the silly, happy atmosphere might make you want to skip. Go ahead, you can do that. You may not be the only one! 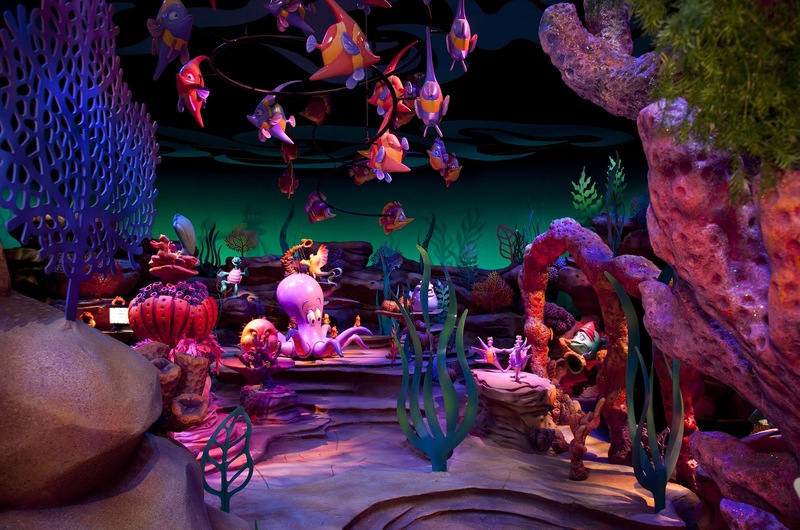 Step into a Clamshell and ride through Ariel's underwater home complete with characters from the beloved movie and the music that you love. Cap off the ride by meeting Ariel in her grotto. The attraction is colorful, technicolor fun. This will become a new favorite. You will feel like you are in the Disney classic film. Even the queue is fun. 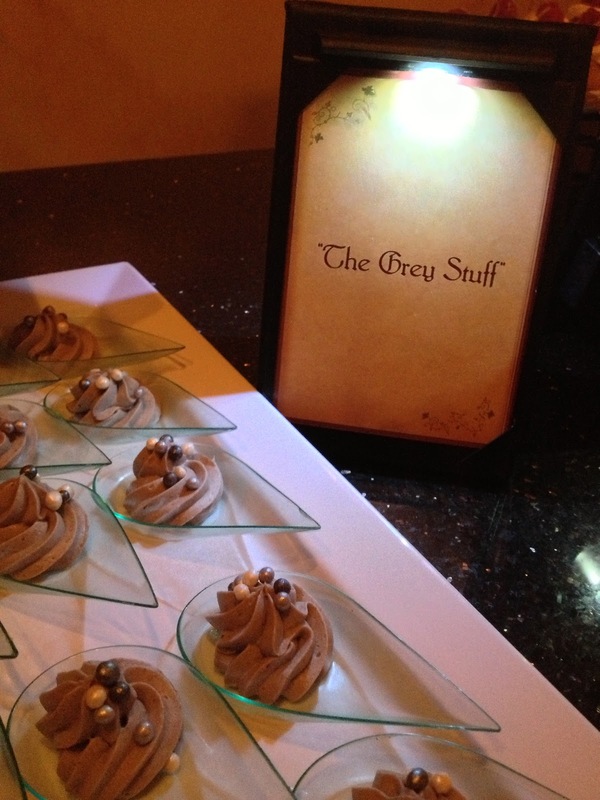 At Be Our Guest, try the Grey Stuff. It's delicious. Really! I won't give away its secret but you must try it when you go! It snows. Just outside the windows in the Grand Ballroom it snows, drifting softly just outside the windows of Beast's Castle. In this new concept restaurant inspired by the classic Disney Film"Beauty & the Beast," guests can enjoy fast food during the day (with the help of a magical rose!) while in the evening the space becomes a full service dining experience. Take some time and walk around the restaurant. In the Grand Ballroom look up. It's the same ceiling and chandeliers from the iconic dance scene. 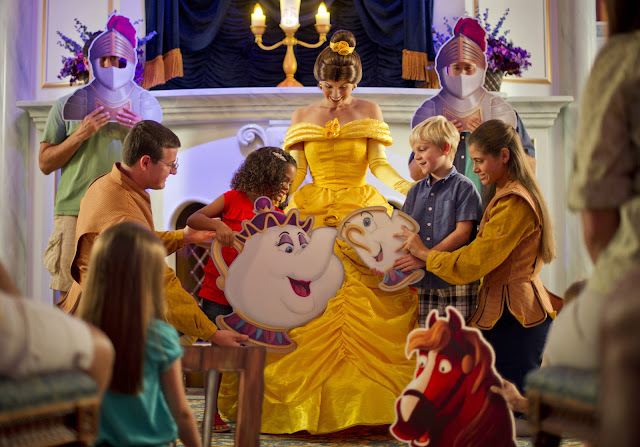 Be sure to also step into Beast's dark and mysterious West Wing (where Beast tore apart his human portrait), and the delicate Rose Gallery where a magic rose floats ethereally (again Disney magic!) During the media event, we were able to try a number of different menu items. I remember several times trying a new dish and closing in eyes in utter happiness. The food is outstanding. This is my absolute new favorite restaurant on the property. Gaston, oh Gaston. Little boys and BIG BOYS are going to love this new manly man kind of place. You could call this French Country Hunting Lodge. For light fare, this place can't be beat. Be sure to try LeFou's Brew, a non-alcoholic drink that tastes of crisp apples and marshmallows. 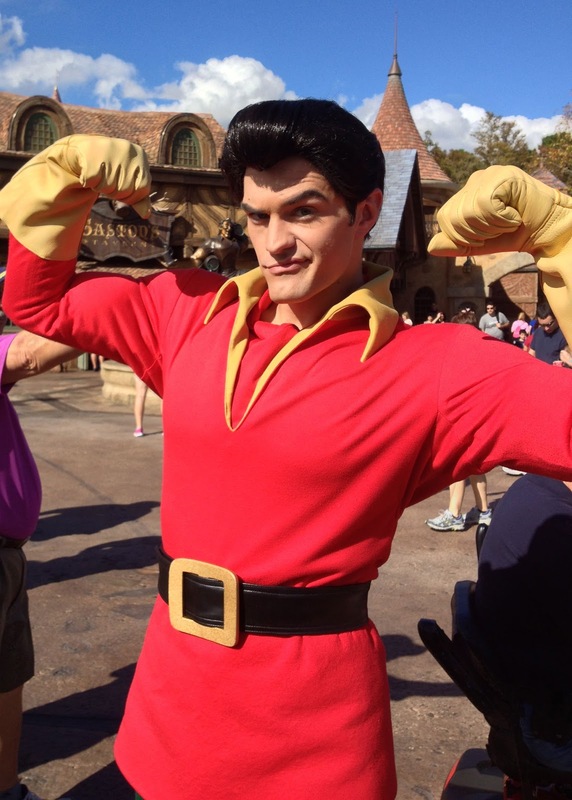 If you're very very lucky you just might get to meet Gaston. Look for him. He's the guy in the red shirt with the impeccable jawline. You may find him gazing lovingly. . . at himself in a mirror. When you were little you loved riding Dumbo and in that scrapbook your mom made, there's a picture of you waving to her as you giddily fly with Dumbo, right? Guess what? 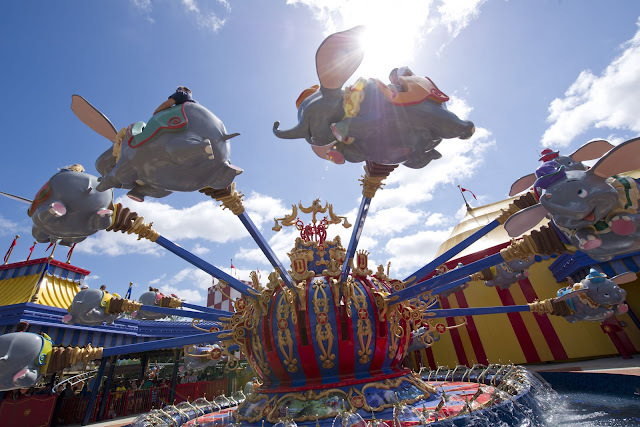 In this new Fantasyland, there are now TWO Dumbos attractions, each flying in a different direction! The best part of this attraction? There is no more long line waiting outside in the sun with the kids. Instead you're given a pager and as you wait, kids can play inside the air conditioned area and run some of that excess energy off. It's a great new concept that will be a huge hit with hot parents and energetic kids. A "light" roller coaster for kids (and parents) who may not be ready for the bigger coasters. Oh, that silly Goofy and his runaway roller coaster! As a highlight in Storybook Circus, kids can meet with their favorite characters including Minnie Mouse, Donald Duck, Goofy and Daisy Duck. As a member of the media, it's easy to be cynical. We've been there. We've seen behind the scenes, behind the magic. But last week when I stood there with hundreds of other media enjoying a party in the Enchanted Forest we looked up and saw an enormous dragon flying above us, squawking and spitting fireballs. I looked at the faces of the reporters all around me in the orange glow of the evening light and I saw delight. I saw happy. I saw. . .magic.